Will Maya get swayed by Maddie's wayward ways, or will she stay true to her "permanent group" from coding club? 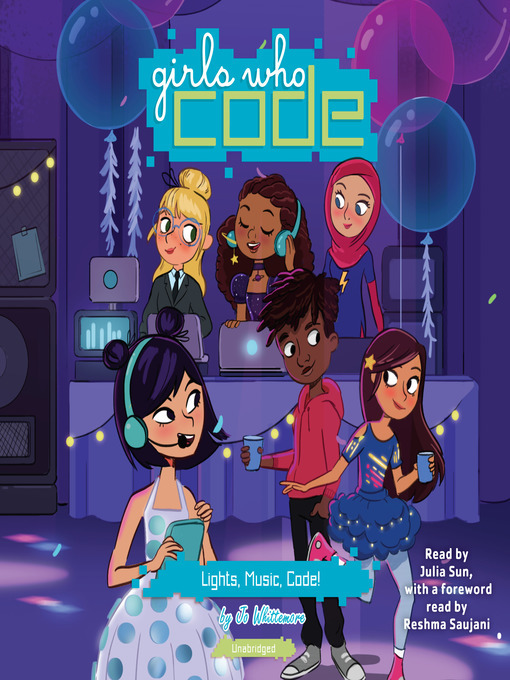 And will she come through on her part for the light and music coding project? Maybe coding—like friendship—is about being there for your friends when they need you the most. "Maya, you are seriously looking fierce," I said, pointing at my reflection. She smiled at the compliment. Either that or she was hoping I'd finally pick an outfit after ten costume changes. I'd bought a killer top over the weekend, and it begged for the perfect shoes and skirt. They were just taking forever to find. 1. I was the fashion columnist for my school paper and needed to look the part. 2. It was Monday, and Mondays were bad enough without adding sweatpants. 3. My friends and I had just made it onto the local news, which meant all eyes would be on us for the next few days. Loop to reason one. I decided to stick with my last combo: gray leggings and a plum-colored skirt paired with my lemon-yellow top. I added rain boots in the same yellow to pull it all together. The bright colors were a little daring, and my nails would've looked better with purple polish than with pink, but fashion is all about risk. Plus, I'd just spent ten minutes in front of my bedroom mirror and was about to miss the school bus. I tossed my less-than-perfect clothing options in the closet and caught my reflection in several more mirrors . . . tiny ones I'd sewn into a dress. My school was having a dance on Saturday, and the theme (thought up by yours truly) was "The Future Is . . . " So I'd bought a bag of craft mirrors and painstakingly glued them onto an old white sundress I had. I got the idea from a mirror-covered dress I'd seen at the mall. It would've been easier to buy the store version, but there was no way my parents would give me the money. Why? Because they still liked to remind me of the last time they paid for something of mine. It had caused a sticky situation, literally and figuratively. And it was also the reason I didn't wear purple nail polish anymore. See, I have a big secret I haven't told even my closest friends. Because if they—or anyone else—knew, they'd never look at me the same. The fact is that I, Maya Chung, am a former shoplifter. Well, a one-time, unsuccessful former shoplifter. Crazy, right? You wouldn't think it to look at me, but it's true. And it's all because of Nicole Davis, a girl I became friends with over the summer. She was visiting her aunts who live down the street from my family, and since we were so close in age, one of Nicole's aunts suggested we hang out together. Things started out great. Every time I saw Nicole, she had a new pair of earrings or a cool top to show off. She'd even let me borrow her stuff for days at a time. But then I found out how she'd gotten these newfound treasures: She'd stolen them. And the "borrowing" she'd let me do? It was to keep the items out of her house so her aunts wouldn't notice them. Pretty tricky, right? Even worse, she got me to try shoplifting! Emphasis on the word try. I may have toppled a nail polish display while sneaking a bottle of Purple Rain into my purse. My mom and stepdad, Oliver, were furious, and they had to pay for all the nail polishes I'd broken. Needless to say, asking them for money before I turned eighty was out of the question. "Maya, I hear the bus coming!" Oliver shouted upstairs. Giving my reflection one last glance, I slung my backpack over one shoulder and hurried down. "Goodbye, parental units. I love you and beg you not to wave from the porch." I paused to kiss Mom on the cheek, and she looked me over with a frown. JO WHITTEMORE is the author of the tween humor novels, Front Page Face-Off, Odd Girl In, D is for Drama, Colonial Madness, and the Confidentially Yours series. She also penned The Silverskin Legacy fantasy trilogy. When she isn't writing, Jo spends her time with family and friends in Austin, dreaming of the day she can afford a chocolate house.